The Celtics have been one of the most unpredictable teams all season and there is uncertainty regarding their path to the NBA Finals. The Crossover examines why Jayson Tatum and Jaylen Brown are the key to Boston's playoff hopes. There’s been enough drama to last a decade in Boston this season. The Big 3 era certainly had its tumultuous moments, and the early days of Paul Pierce with Antoine Walker were filled with more headaches than playoff successes. Still, those teams were downright tranquil compared to the Celtics’ turbulent 2018-19. Boston has been the league’s most unpredictable team this season. It looked to have turned over a new leaf in January, winning four-straight to open the New Year. That streak was followed by a trio of road losses. The Celtics won 10 of 11 from Jan. 16 to Feb. 5, then lost five of six. The beginning of March brought five wins in six games, but Boston now enters Friday’s battle with Indiana following four-straight losses and a win over the Cavs. As Brad Stevens keeps his even keel, his team has wildly fluctuated in its performance. Boston’s moody ways aren’t necessarily surprising. There are big personalities—including the boisterous Marcus’, Morris and Smart—and plenty of players in need of significant minutes. And then, of course, there’s Kyrie Irving. It’s a touch unfair to lay Boston’s adversity solely on its mercurial point guard, but the 2016 Finals winner is far from an innocent bystander. Irving said he “plans on staying here,” during the Celtics’ Fan Fest at TD Garden in Boston in October. In February, he assessed his upcoming free agency by telling reporters, “ask me July 1.” Irving has lectured his younger teammates through the media on numerous occasions, noting his three years of Finals experience. Does Irving forget last year’s run to Game 7 of the East finals? There’s been plenty of hand-wringing regarding Irving’s peculiar season, yet among the chatter, he’s quietly put up an All-NBA year. Boston is scoring 118 points per 100 possessions with Irving on the floor, tied for the best mark of his career. Irving is a full assist per game over his previous career high, tallying 7.1 dimes per game. He’s shooting 49% from the field and 39.8% from three, in line with previous career averages. Irving is ninth in three-point percentage among the 31 players with over 150 threes. All three of Boston’s best three-man lineups by offensive rating involve Irving, led by the Irving-Morris-Jayson Tatum trio. Irving remains one of the league’s elite offensive guards. Despite the self-inflicted headaches, Irving has remained been a consistent force on the floor during the regular season. He’s a bankable star in the postseason, too. Irving is a seasoned playoff performer, proving his mettle over three Finals runs and one of the most important shots in NBA history. Irving averaged 23.9 points per game in his three playoff runs with Cleveland, shooting 41.5% from three. He won’t shrink from the moment in April and May. His production is all but guaranteed. So what’s to explain the uncertainty regarding Boston’s path to the Finals? The question marks emerge with Boston’s wings. It’s certainly a talented group, yet one that has struggled to find consistency throughout 2018-19. Boston doesn’t need all three of Jaylen Brown, Jayson Tatum and Gordon Hayward to shine throughout the playoffs, but their collective production remains critical to Boston’s Finals hopes. Hayward is perhaps the least puzzling of Boston’s wings. Aside from a few strong nights, he’s struggled to approximate even 80% of his Utah production. Hayward is still a touch hesitant in the paint, with a dose of athleticism zapped by a catastrophic leg injury. He’s been a shaky shooter, too, making just 33% of threes on just over one made triple per game. Hayward is still a valuable playmaker and a quality secondary ball-handler, but it’s hard to see him as a member of Boston’s crunch-time five. The Celtics can survive without Hayward’s production. They’ll likely face an early exit without a strong effort from Tatum and Brown. Tatum doesn’t need to be the focal point he was last year, of course, but he does need to improve in the playoffs compared to what we’ve seen thus far in his shaky second season. Perhaps unfair expectations were raised after an impressive 2018 playoff run. 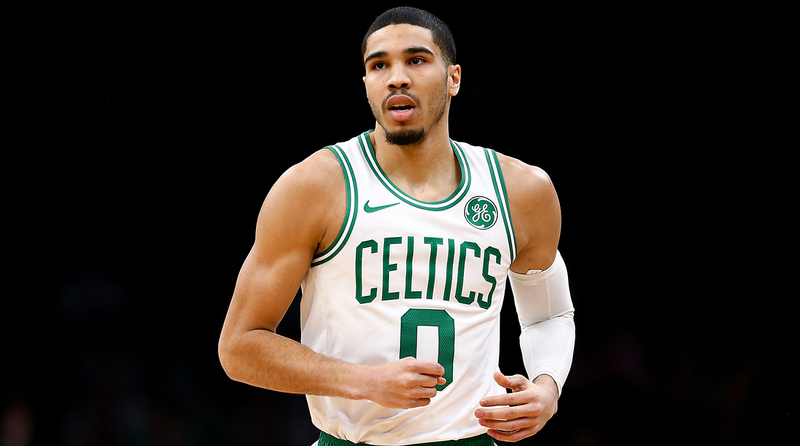 Tatum went from a solid third-place finisher in the Rookie of the Year race to LeBron’s chief foe in the East, deemed an untouchable piece in any potential Anthony Davis trade. But his status as an elite prospect has dipped since the beginning of this season. Tatum has regressed from three in 2018-19, going from an unsustainable 43.4% last year to 36.3% in 2018-19. And the troubles extend past his dip from beyond the arc. He’s prone to settling for contested jumpers, and he has a tendency to monopolize the shot clock. Most players of Tatum’s age and draft status start their career on bad teams, jacking up shots as losses pile into early April. Tatum doesn’t have that luxury. He’s confined to a winning system, and for Tatum, less is often more on the offensive end. If Tatum can embrace the free-throw line and his spot-up game, Boston’s clogged machine will begin to hum with authority. Brown has been a key casualty in Boston’s expanded lineup. His minutes and scoring have dipped this season, with muted success next to Boston’s stars. Brown was plus-7.4 points per 100 possessions with Irving last season and plus-10 points per 100 possessions with Al Horford. He’s down to plus-0.7 and plus-1.7, respectively, this year. The statistical profile is a bit misleading, though. Brown shot a dreadful 28.4% from three before the New Year. He averaged as many turnovers per game as assists. He hesitated on the catch, losing much of his catch-and-go verve that powered an impressive sophomore season. One of the league’s smartest players remained too deep in his own head. Brown has regained his aggressiveness as his shot improved in 2019. He’s shooting 38.3% from three since January, 41.8% since March 1. Like Hayward, Brown may not be in Boston’s closing five. But don’t discount his impact. A strong playoffs from Brown could vault Boston over the East’s gauntlet. The Celtics will likely have to face two of Toronto, Milwaukee and Philadelphia in the postseason. They’ll need strong perimeter production from Brown and Tatum to reach their second Finals of the decade.